I’ve been doing journalism for the past four years, and because I was first introduced seriously to photography in journalism, I was taught to learn to capture the moment, capture the spontaneous, capture the candid. But when I was given an assignment, this was part of my portfolio for an application, I wanted to experiment with photography without having to capture the moment. I wanted to experience photography where I could map out every element, and I really wanted to see what kind of visuals I could get, compared to my candid ones, if they were all set up exactly how I wanted it. 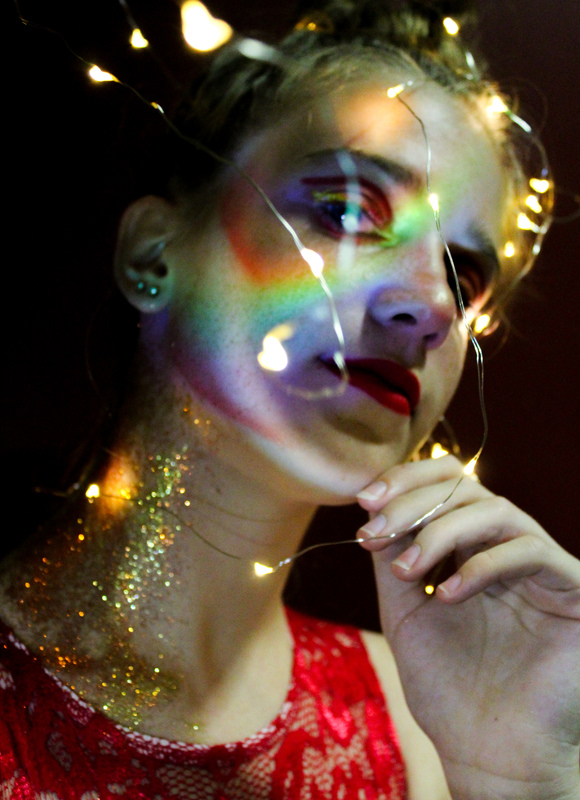 I had seen lights and rainbows used by popular celebrities on Instagram, but I wanted to add my own backstory to it. My friend shown in this picture is a dancer, so we styled her hair into a bun and put her in a leotard. Although it is not obvious in the photo, I wanted to capture the feelings of a dancer on stage, the way they look into the lights and the rainbows created by the lights against the air. Seo Yoon Yang’s dream is to attend a film college and become a film director in L.A. She started a YouTube channel under her name Yoonie Yang and is hoping to start her film career with that social media program. She loves photography, journalism, and animals.